You've joined forces with Alex to build the ultimate shelter, from where you can venture deeper into the mountainous Minecraft™ landscape. This awesome, huge shelter with its rooftop garden, waterfall and secret lava entrance has put your Minecraft creativity and building expertise to the test, now it's time to sit back and relax. Shear the dyed sheep, do a spot of fishing to feed the cat, grow crops and organize them in the chests, and enjoy the base's luxury interior, with carpets, anvil, oven, three crafting tables and multiple rooms and doors. It's the perfect base to defend against the endermen, zombies and other hostile mobs that roam after nightfall! Price is 20% above the initial Lego retail price! This comes down to 16.45 cent per brick. 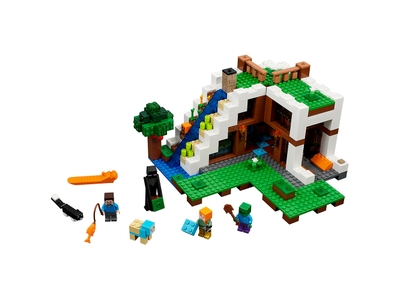 The The Waterfall Base (21134) Lego set is no longer directly available from the sites below. However, 3rd party partners of these sites might still have the set available. Alternate description Build and defend the awesome Waterfall Base! Includes two minifigures: Steve and Alex, plus a buildable enderman, zombie, cat and dyed sheep. The Waterfall Base features a waterfall, roof garden, secret lava entrance, four doors, plus a detailed interior with a furnace, two item frames, two chests, two beds, an anvil and a crafting area with three crafting tables. Open The Waterfall Base to access the detailed interior and remove the roof to extend the play area. Slide the panel to reveal the secret lava entrance! Shear the dyed sheep, do a spot of fishing, feed the cat and grow crops. Grab your diamond sword and defend the base against the enderman and zombie. Accessory elements include a fishing rod, wheat, sugar cane, fish, pumpkin, sheep shears and a shovel. This set includes over 720 pieces and offers an age-appropriate build and play experience for ages 8+. Measures over 7” (20cm) high, 9” (24cm) wide and 9” (24cm) deep.